It is that time of the year again when the heart of every Indian swell with pride. It's time to commemorate our successful fight for Freedom and remember the countless sacrifices made by our freedom fighters to give us independence. On this special occasion, Pacific Mall, Tagore Garden has announced a long celebration to celebrate India’s 71st Independence Day. This year for the first time, Pacific Mall brings luxury Auto Arcade –7 vintage cars display. 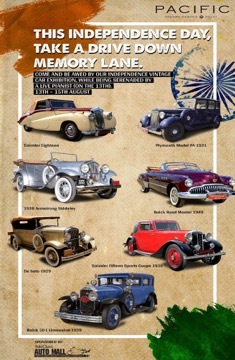 The 7 Vintage cars on display, in association with Relio Quick Auto Mall, include 1938 Armstrong Siddeley, Buick Road Master 1949, De Soto 1929, Plymouth Model PA 1931, N nm, Buick 50 L Limousine 1929, Daimler Eighteen or Daimler DB18 1952 (Daimler Consort), Daimler Fifteen Sports Coupe 1936. Apart from the Car Show this year’s highlight is a replica of Qutub Minar. 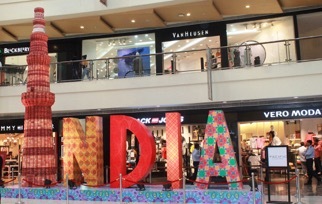 The 20 feet high replica and colourful letters in an array of prints and patterns spelling ‘India’ created at the mall is a perfect selfie point for the customers. The visitors can take a selfie in front of the replica and share their memories by hashtag #qutabminaratpacific. Speaking on the occasion Mr Salim Roopani, Centre Director, Pacific Mall, Tagore Garden said, “The idea is to steer away from the usual tri-colour decorations but still maintain the essence of the day by celebrating India and the feeling of being an Indian. We want each and every Indian to feel special on our 71st independence therefore want to make their celebration at the mall very memorable.